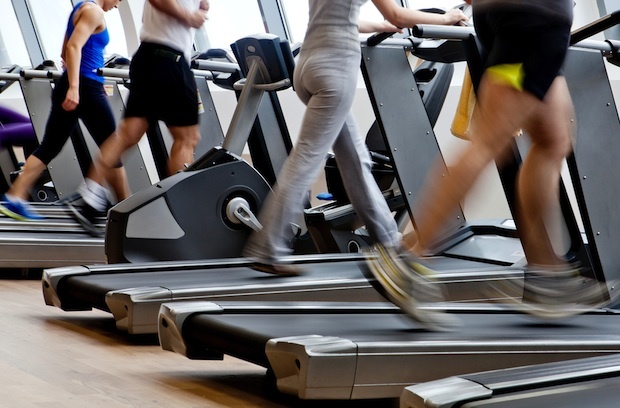 Research shows there’s an underlying reason we have “favorite” fitness equipment in the gym. You may have your reasons for using a favorite treadmill at the gym, but research shows that young women are drawn to equipment that's near overweight or flabby peers. Photograph courtesy of Shutterstock. I have a favorite bike at my indoor cycling studio. It’s in the front with the rest of the intense folks, but to the left-hand corner of the room. Why am I drawn to that particular bike? Partially because it means I only have to sweat profusely next to one person instead of sandwiched between two, and it’s hidden just enough so that the instructor can’t yell directly into my face. It turns out I’m not the only one with a favorite bike, treadmill, or elliptical at the gym. In a quick survey on Facebook and Twitter, readers told me they prefer the end treadmill: “I hate running in between two people—drives me nuts!” Another said it “totally throws my game off” if he doesn’t get his favorite treadmill. Even our very own associate fashion editor, Sarah Zlotnick, said she likes the third bike in the front row at her Columbia Heights gym because it’s not in front of a mirror. But according to new research, there may be another underlying reason that explains why we’re drawn to certain fitness equipment—and it’s not exactly something to be proud about. Turns out young women are quicker to choose a piece of exercise equipment when it’s next to an unfit or overweight woman. The study involved 75 female college students and a toned, fit woman as the guinea pig. First, researchers had the woman dress in shorts and a tight-fitting tank top and use a chest press machine, and timed how long it took each participant to use the piece of equipment next to her. Then they dressed the same fit woman up in baggy sweats, added padding to make her look fat, and repeated the timed experiment. Researchers found that regardless of how fit each college student was, they all tended to gravitate to the disguised flabby woman quicker than when she was dressed in tight clothing. Even so, exercising next to the woman in disguise did not make the female students exercise longer or feel better about themselves afterwards. “The results provide [. . .] evidence that women in a naturalistic environment, when possible, manage their comparison opportunities and do so in a manner that may maintain body satisfaction,” the researchers wrote. Co-author James Kulik told Today Health that young women are more likely to feel self-conscious about their bodies, so the results might not translate to older women or the male population, who are likely to feel more comfortable about their bodies. While the results are sad—and not entirely surprising—one would hope that being self-conscious at the gym isn’t a growing trend. Next time, we recommend actually working out next to that intense gal or guy. You may be surprised by how much harder you push yourself to be better. The full study was published in the journal Basic and Applied Social Psychology.